Lasker was a brilliant man. A mathematician and Chess World Champion. He was born on Christmas Eve, December 24th, 1868, in Brandenburg, Germany. One of my favorite music pieces is Johannes Sebastian Bach's Brandenburg Concertos. Emanuel's older brother, Berthold Lasker, taught Emanuel chess at the age of 11. In 1889 in Breslau, at the age of 21, Emanuel won the German title of Master of Chess. But, most important, it was he that introduced the two-bishop sacrifice. This is the earliest example of that great chess strategy! Only Five years later, in 1894, Lasker challenged Steinitz for the World Chess Championship. Lasker won! He was to remain the World Chess Champion until 1921. The great chess player Steinitz who had been World Champion for 28 years was famous for his introduction of strategy to chess. Lasker is most famous for seeing that chess is a struggle between two minds. In practicing that theorem he smashed Steinitz, Pillsbury and Tchigorin. But before that, Lasker had terrific results. In 1890 in Berlin, he defeated Curt von Bardeleben and Jacques Mieses in a match and he and his brother tied for first place in a tournament as well. Lasker then visited the United States in 1893 where he won the New York International. He defeated the American Champion, Jackson Showalter, with 6 wins, 1 draw, and 2 losses. 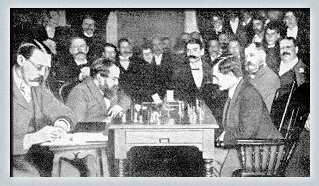 And in 1894 Dr. Lasker realized his desire to challenge Wilhelm Steinitz for the World Championship in New York. Lasker WON with 10 wins, 4 draws, and 5 losses. Emanuel Lasker had become the second World Chess Champion at age 25. Lasker contracted Typhoid fever and was still recovering in 1895 when he took 3rd place in Hastings, England behind Pillsbury and Tchigorin. The German version of his book, Common Sense in Chess was published in 1896 and the English version was published in 1897. The book was based on a series of lectures that Lasker had previously given in London. In January, 1896, Lasker won a tournament in St. Petersburg, Russia, ahead of Steinitz, Pillsbury and Tchigorin. Also, in 1896, he won at Nuremberg with 12 wins, 3 draws, and 3 losses. That same year there was a rematch between Lasker and Steinitz for the World Championship in Moscow. Lasker retained his title with 10 wins, 5 draws, and 2 losses. In 1902 Dr. Lasker received his PhD in Mathematics from Erlangen University. His mentor was the famous great mathematician, Hilbert. Lasker's research centered on geometrical calculus and ideal numbers used in algebra and remains relevant to this day. There is a theorem in the theory of vector spaces that is still known by his name. This theorem deals with prime numbers. Lasker was not only good friends with Dr. Albert Einstein, but in the 1930's they shared an apartment and exchanged ideas during their frequent walks. Dr. Einstein spoke of Lasker: "Emanuel Lasker was undoubtedly one of the most interesting people I came to know in my later life." About this time he was seriously and totally devoted to breeding pigeons for the Berlin Pigeon Fair. At the London tournament of 1899, Lasker finished 4 points ahead of the rest of the field with 18 wins, 7 draws, and only 1 loss to Blackburne. In 1900 Lasker won the Paris tournament with 14 wins, 1 draw and 1 loss. The next tournament Dr. Lasker played in was the Cambridge Springs Tournament in 1904. Dr. Lasker tied for second with David Janowski. Frank Marshall came in first place. In 1906, Dr. Lasker played in the 19th New York State Chess Championship. He won first place; of course he won first place. In 1908, Dr. Siegbert Tarrasch challenged Lasker for the Chess World Title. Lasker was convinced that Tarrasch had hypnotic powers and therefore wanted to play the match from a different room. Lasker again prevailed with 8 wins, 5 draws, and 3 losses. In 1909 Lasker tied with Akiba Rubinstein at St. Petersburg, winning 3, drawing 5, and losing 2. That same year Lasker was given 7,000 francs to play two exhibition matches against David Janowski. Lasker won one and drew one. Lasker was again challenged to defend his title in 1910 against the great Carl Schlecter in Vienna and Berlin. Lasker tied the match by winning the 10th and final game. Schlecter would have become World Champion if he had drawn the 10th game but Lasker retained his title with one win, 8 draws, and one loss. Lasker received 1,000 marks for each game played. Later that same year, Lasker defeated David Janowski in a match in Berlin. Dr. Lasker won with 8 wins and 3 draws. In 1911 Lasker married Martha Kohn. They stayed together until Martha's death in 1939. Dr. Lasker's next great tournament was at St. Petersburg, Russia, 1914. This was a great tournament. Lasker came in first place, ahead of Capablanca, Alekhine, Tarrasch, and Marshall. Lasker had plans to play Akiba Rubinstein for the Chess World Title. Capablanca planned to play the winner. In 1918, after World War 1, Lasker played a chess tournament in Berlin in 1918, and came in first place. In 1920, he resigned his world title to Capablanca with a letter written to him in Spanish. No one in history has ever done this before. This shows what a great gentleman Dr. Lasker was. In 1921, in Havana, Cuba, he played Capablanca who won 4 games and drew 10 games and became the new World Champion. In 1924, at the great New York International Tournament, of course Dr. Lasker came in first, Capablanca came in second, Dr. Alekhine came in third. In 1927, Dr. Lasker returned to Berlin and learned Bridge and GO. He became an International player and Life Master of Bridge. He was the team leader of the German team at the Bridge Olympics. Because Dr. Lasker and his wife were Jewish, they fled to England in 1933 after their property was confiscated by the Germans. They lived for a short time in the USSR and finally settled in New York in 1937. Dr. Lasker came in 5th in Zurich in 1934, 3rd in Moscow in 1935, 6th in Moscow in 1936, and 7th in Nottingham in 1936. After moving to Manhattan, New York in 1937, Lasker began teaching chess and bridge and writing philosophical articles including, Struggle, Understanding of the World, The Philosophy of the Unattainable and The Community of the Future. Dr. Emanuel Lasker died in Manhattan on January 11, 1941. Dr. Lasker's winning percentage is the highest of any World Champion: 66%. He won 52, drew 44 and lost 16 games and scored 74 points in 112 games. He defended his chess World Championship title 7 times in the 26 years he was World Champion. His calculated peak ELO rating is 2720. In his stellar career he played in 10 international tournaments; he came in first 8 times, 2nd once and 3rd once.